Its really hard to post something on Craftster when you have a hell of a time organizing the pictures, random things on your computer stop working, the internet is INCREDIBLY slow because your brother is downloading music and movies nonstop and when you ask him to fix something he closes out of the browser with your half typed post! Well this week my brother decided to move his room around so I got itchy to do the same.... I ended up not moving too many pieces of furniture around but rather a mega organizing overhaul. I really like to move my furniture around, like a lot. 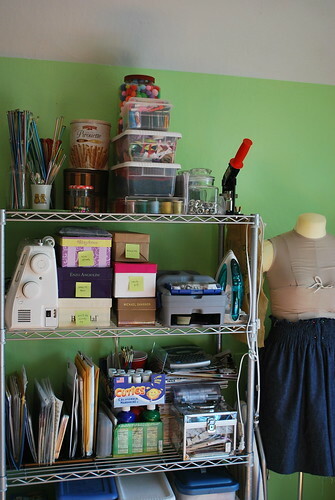 But it seems like I get to do it less and less seeing as how I am beginning to stumble on the perfect set up [using what available to me] The biggest thing for me is keeping my room area and craft area relatively separate. I just seem to work better like that. I think I've done a pretty good job of that, don't you think? 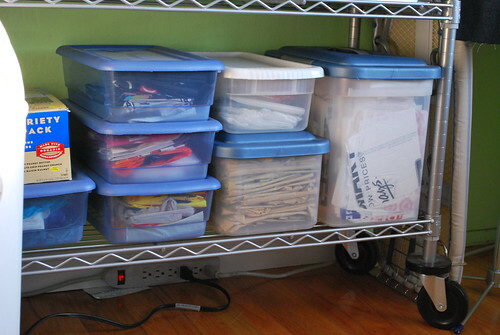 And I must say I love the new organizing, its much easier to get supplies, clean them up and see what I have. 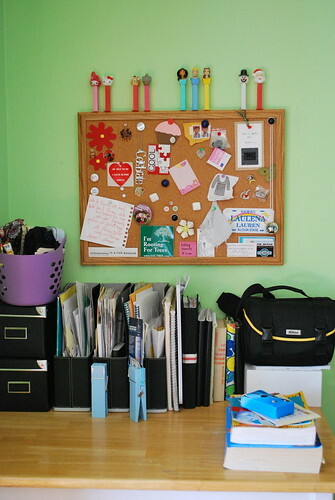 There is now a place to organize all the paper and thing-a-ma-bobs I save for collaging [still have to organize those, but its all set up! 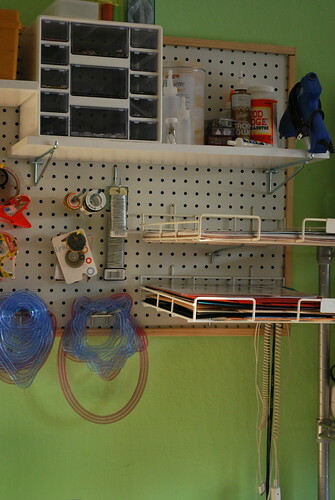 ], I have a place to store WIP's and my pegboard is better suited to my needs. Bliss. 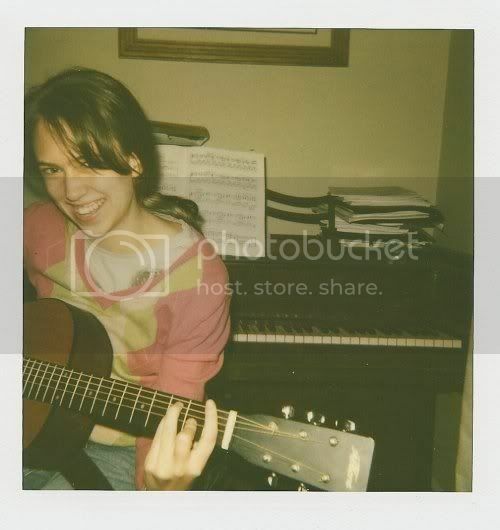 I hope you enjoy looking at the pictures and maybe gain a bit of inspiration or happiness. I know that my room might not to be to everyone's tastes but for now, it's perfect for me. I am grateful for what I have. As you can tell I tend to gravitate towards bright + fun colors and childish things. Haha. However much I wish I could have a sleek, simplistic, modern room, that's just not me. I am WAY to much of a packrat. Here is the view as you walk in. 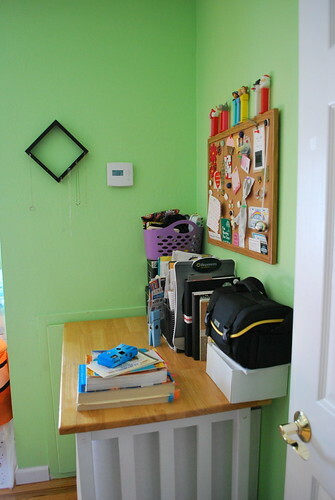 Yeah my walls are painted lime green, I think its called Key Lime and from Behr. Yeah its kinda "in your face" but I've gotten used to it and it makes me happy :] Anyway, I use this little desk to throw stuff on as I walk in my door [purse, keys, phone] and to organize papers/mail/school stuff I might need later on or want to save. Honestly the three magazine organizers are a life saver and probably the biggest improvement to my room this round. There are three categories, personal, school, and sports. I get a lot of swimming ribbons, hence the sports folder. And yeah bulletin board, self explanatory . The black boxes hold random electronic stuff, and the purple basket is full of little bags, coin purses, etc. Then there are my journals/sketchbooks/collage book thing-y and my camera. So here would be my bed. I must admit, I'm not crazy about the bedding and have half thought out plans in my head for a duvet cover of some sort. Yes my bed is on the ground, I removed the frame this week and plan on getting small risers to keep it low. My nightstand if you can even call it that is a few of those bubble cubes so popular a few years back. The top just hold some money, my glasses, remotes and the like. Oh and handy dandy Febreeze. The next cube has my knitting and change jar. Under that is my swim stuff..... bag, suits, goggles and all that jazz. And my cute little fishy hamper has a few random skeins if yarn + the plastic bag yarn I made. P.S. I know I spelled "persuits" wrong, its fixed now. I knew it looked kinda funny. This picture gives a better idea of my bed "nook". I painted that wall with magnetic paint and has been quite fun to play with, I have your average assortment of magnets plus those kiddy alphabet ones and magnetic poetry. Fun when you are bored and lazy! A close op of random jars that I like to keep, would that be a collection? 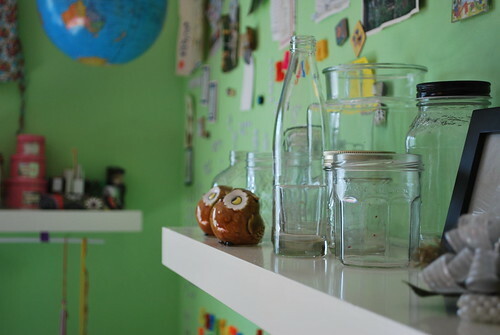 See my little owl salt and pepper shakers? And here is shelf number two! The purple box holds manuals and cords for my iPod and graphing calculator.... the lavender was a graduation gift from my Aunt. oh and the silver think you see is a lamp, its nice and bright so I can just have that on at night when I am journaling or whatnot in my bed. Then there is my eraser collection [I love erasers]a nd office supplies [tacks, post its, magnets]. What's that funny thing hanging under the shelf? 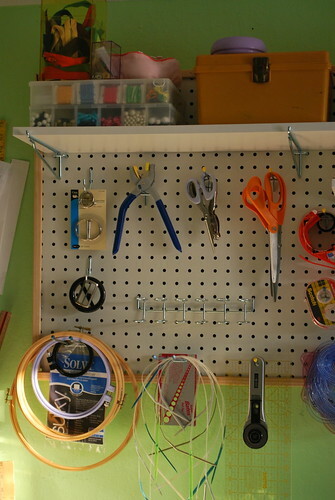 I used a dowel and hung it under the shelf using loops made from ribbon and flat tacks.... There are a few soccer medals on it plus a lanyard, friendship bracelet, graduation tassel and grad night id badge. 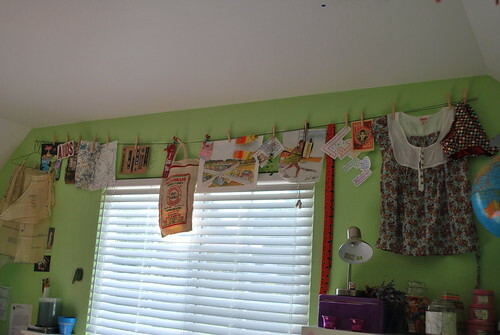 I hang different stuff on it periodically. And here is another new addition, the "inspiration line". Lots of random papers, bits of things, fabric , blah blah blah. I used to hang things on my walls with tacks but after realizing that it probably wasn't a good idea when you change things up every few weeks I switched to tape, but I like this much better and so do my walls. Yes that's a shirt and bikini bottom hanging up there. They are there to remind me to do what I am supposed to, eat well and exercise. My mom was in an accident while on a trip so we spent a week in a different town eating at the hospital... In a matter of week I put on ten pounds and its kinda just snowballed to 15 since then. So its my reminder to accomplish my goal. Cd shelf with DVD's, CD's and other random office-y things. Sudoku books anyone? Then there is my TV and Madge aka the dressform. Right now she is wearing part of a dress I am trying to work on but need help. Wanna help me? You can see how that shelf has changed! Here is the afore mentioned shelf in all its glory! 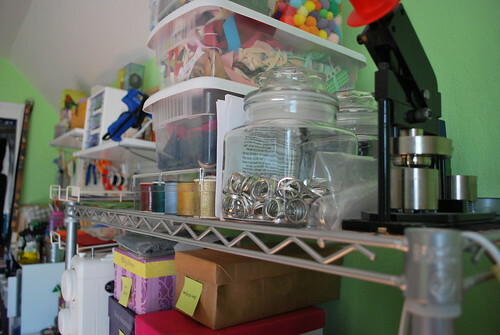 I must say that those ever so popular wire rolling shelves are perfect for crafty rooms, they hold a ton of stuff and are sturdy. Because I don't have a close up of the first shelf I ill point out everything in this picture. Sewing machine, shoe boxes holding WIP's [I even labeled them! ], Dremel, and iron! Anybody have any fun crafts to do with a Dremel? The top holds knitting needles [they were my great grandma's and were given to me by my grandma] which are hiding behind the plastic boxes of pom-poms, ribbons, bias tape, felt and thread. My buttom making machine and all the supplies for that are also up there. 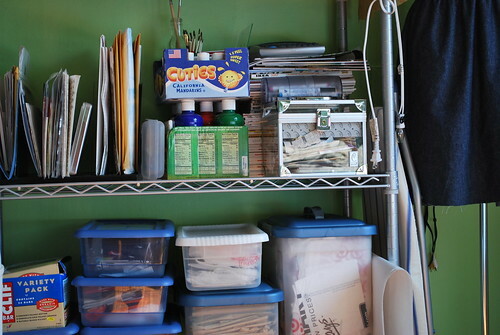 The middle shelf is paper crafting and collage stuff. The black thing is gonna hold all my clippings, papers, etc for collaging once I sort them all. The "Cuties" box hold acrylic paints + paintbrushes and the box under that hold tempera paint. [I had to make 678567849 posters for yearbook last year] And finally there is a stack of magazines, a label maker and a box for 3D collage materials. And the bottom shelf, this is probably why you all are going to think I am crazy. I have been obsessively collecting plastic bags for quite some time now and have amassed a pretty good sized collection. So I folded them and organized them by color and then out them in plastic tubs. Yeah. So much easier to find colors and specific types of bags..... I use them for plastic yarn and I've been experimenting with fusing them. :] Its fun, try it! 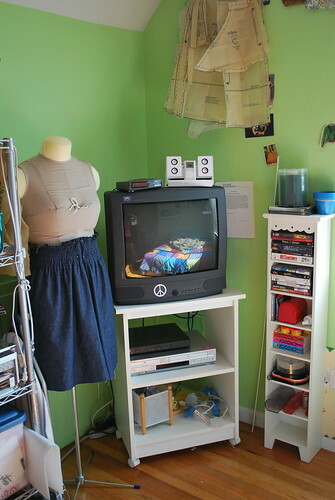 Here is the entire crafty side of my room. Sorry about the weird lighting, the sun shines right into my room as it sets. A better view of the actually crafty parts. I used to have a huge desk, but I found i just left a huge mess on it and used it to store stuff. So a smaller desk forces me to be more organized and aware of how I craft. Since I use it as my computer table as well, as soon as I am done crafting I have to clean up if I want to get on the computer. It works! 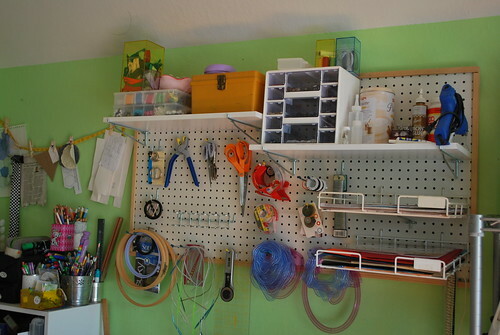 On the left side of the pegboard I keep my zippers, embroidery thread, beads, pin cushions and sewing box [on the shelf]. There is also scissors, embroidery hoops, circular knitting needles, rotary cutter and guide and tape. I kinda just organized and laid it out based on how my mind works... so it might look a bit funny to you! On the right side shelf I keep my button organizer and glues and hanging there is jewelry making stuff, Creative Memories paper cutters, paper shelves for non scrapbooking paper [patterned and solid], and computer cords. 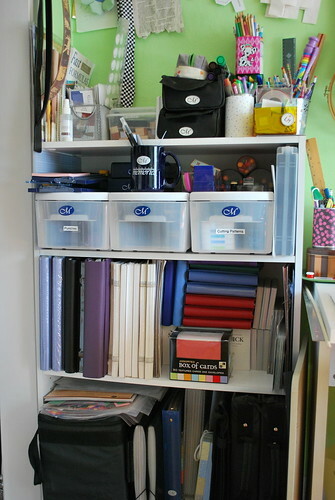 Here is the scrapbooking + stamping shelf. Or bookcase? At the very top there are stamps and markers, Sharpies, colored pencils and the like. 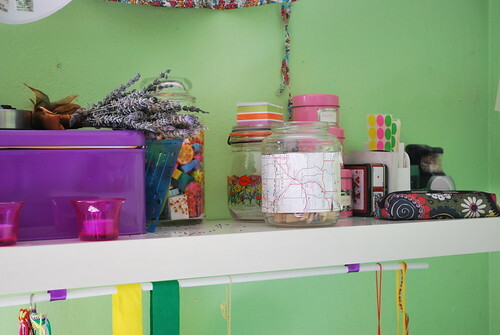 The first shelf down has paper cutters, scrapbooking pens, drawers [shape punches, stamp pads, and random stickers] and acrylic stamp blocks. Middle shelf holds albums, pages and unopened paper packs. 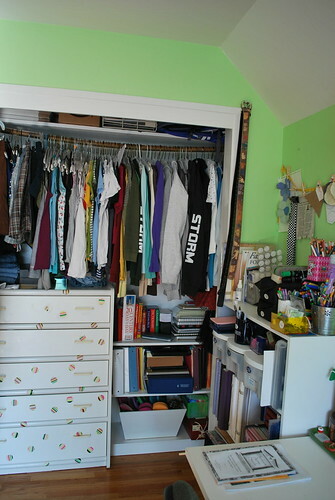 And since I also live in this room, my closet holds my clothes.... the bar is sagging, because I took out the bottom bar and managed to squeeze everything onto on bar. In doing so I was able to put my dresser and another small bookcase in there for more crafting space! The dresser obviously holds more clothes and the shelf has school/reference books and a bunch of school stuff, binders, calculator, etc. Oh AND there is a bin of flip flops, haha. What kind of Californian would I be without 590245923485 pair of flip flops. ;] Stereotypes, ugh. I've had pen pals ask me if I meet celebrities all the time because I live in California. California doesn't equal Hollywood. Moving on, my crazy lamp with purses hanging on it. And the best part yet! FABRIC, yummm. Pretty self explanatory yes? :] Oh and the swimming awards. I'm not a good swimmer, its just these past few years all the girls in my age group were worse, haha. Not so much anymore. close up of fabric, who doesn't love fabric? Its funny to think that my stash started out in the plastic bin the now holds the white plastic bags.... I got it for Christmas one year and went fabric shopping with some of my gift money and outgrew it in a few days, haha. I LOVE your room!! I was laying in bed lastnight thinking I need to create a craft area 'cos I'm starting to get more and more of it and I wasn't sure how I was gonna go about it. Your room as inspired me and has given me some great ideas so thank you! Too many ideas, not enough funds! OMFG you taotally rock! 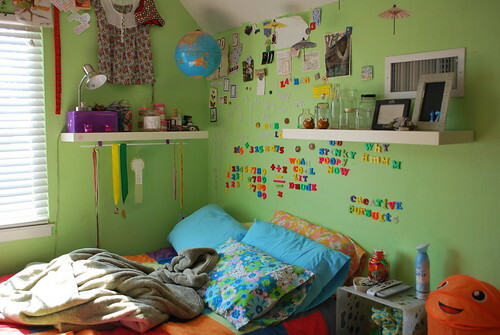 And it's not childish at all, I love the green and now I so want a magnetic wall! (and i'm a 27 year old mum ). 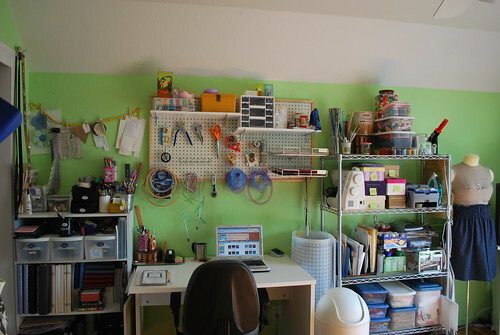 That is so much more organised then I could ever be, congratulations for making your space work so well for you. 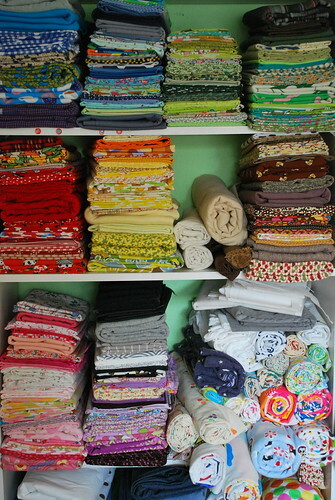 Everything looks fantastic and I am totally lusting after your fabric selection . Trust me the magnetic wall is PURE fun! I do have some tips if you do paint. First of all don't tape off the area you are painting, you will end up with a fat visible line like I did. When you get to your boundaries just kinda feather it out. And follow the directions! Let it dry! I stuck stuff on mine early and now there are parts where the magnetic paint is exposed. This is absolutely amazing! The magnetic paint is sheer brilliance. 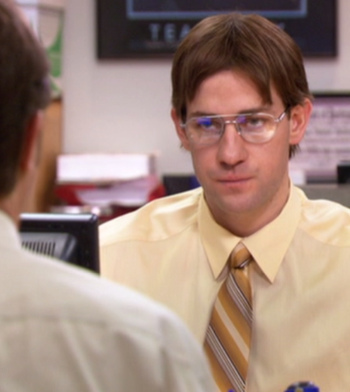 I want to be you when I grow up. 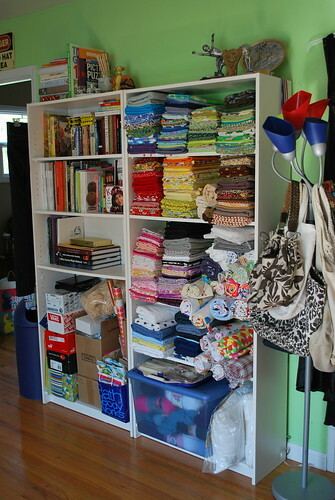 Woooaaah, organized much? 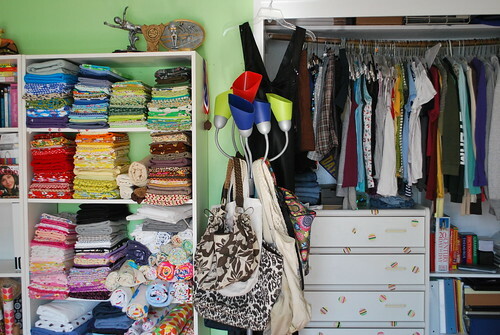 I LOVE organization overhauls, I do them every few months- me and my bfs room, the kitchen, the linen closet. 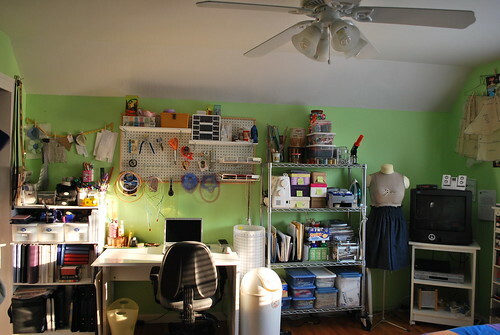 Your space is awesome, it looks so ascessible and inspiring! 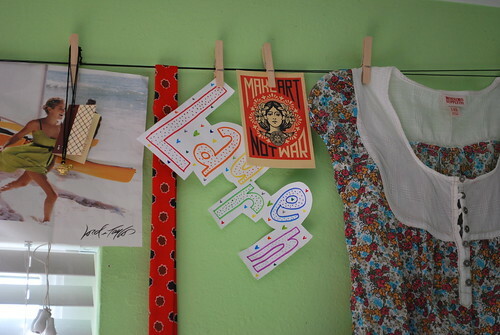 I especially LOVE the clothsline idea (and the make art not war bit) and the wall color- I'm painting my kitchen that color! I'm so jealous of your space...damn my tiny NYC apt. Oh, and I also love that you named your dress form! your room is awesome! you are my inspiration! 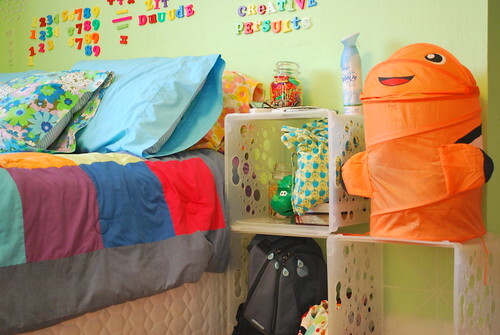 i wish i could keep my room as tidy as you!! great job! I LOOOOOOOOOOOOVE it. I love organizing and moving things around too. You did a great job and it looks like craft heaven to me. Enjoy!!!!!!!!! !